Warnings have been posted in the extreme northeastern Philippines as Parma has powered up into a Super Typhoon, and its new forecast track takes it over the northeastern tip of the Philippines, and three NASA satellites are keeping tabs on it. Public storm warning signal 1 is in force in Camarines Norte & Sur and Catanduanes, the Philippines. Overnight, Parma's sustained winds increased to 149 mph (130 knots), just 7 mph shy of a Category 5 typhoon. Right now, Thursday, October 1 at 0900 UTC (5 p.m. local Asia/Manila Time or 5 a.m. EDT) Parma is a strong Category Four Typhoon. The U.S. Navy's Joint Typhoon Warning Center forecast noted "Parma located approximately 520 nautical miles east-southeast of Manila, Philippines, near 12.7 North and 129.0 East. Parma has tracked west-northwestward at 18 mph (16 knots) over the past six hours. NASA's Aqua, Terra and Tropical Rainfall Measuring Mission satellites have been flying over Parma from space, providing valuable information on the storms clouds, temperature, rainfall, and more. NASA's Aqua satellite flew over Parma on September 30 at 12:59 p.m. EDT (16:59 UTC or 12:59 a.m. local Asia/Manila Time on October 1). Both infrared and microwave images were created from the Atmospheric Infrared Sounder (AIRS) instrument, and both showed very high, powerful thunderstorms, a sign that the storm was intensifying. Amicrowave image was created combining AIRS and Advanced Microwave Sounding Unit (AMSU) data. AMSU is another instrument that flies on NASA's Aqua satellite. The microwave image revealed cold areas in the storm that indicate ice in cloudtops, and heavy precipitation. Around the eye are the coldest cloud temperatures, as cold as -63F. Microwave data suggests cloud heights to the 200 millibar level, near the tropopause. 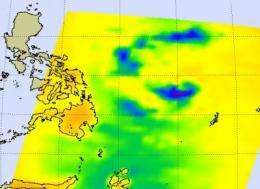 NASA's Tropical Rainfall Measuring Mission (TRMM) satellite also flew over Parma one hour before Aqua, to get an idea of the rainfall that the storm is generating, and what it may be bringing to the Luzon area of the Philippines. 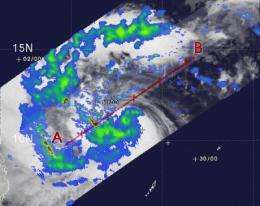 TRMM is a joint mission between NASA and the Japanese space agency JAXA that can estimate rainfall in a tropical cyclone from its vantage point in space. TRMM has been providing valuable images and information on tropical cyclones around the tropics for almost 12 years since its launch back in November of 1997. Armed with a combination of passive microwave and active radar sensors, TRMM provides unique images of tropical cyclones, and they are created by the TRMM Team at NASA's Goddard Space Flight Center in Greenbelt, Md. It's a complicated process to make those images as rain rates in the center of the image are from the TRMM Precipitation Radar (PR), the only spaceborne radar of its kind, while those in the outer portion are from the TRMM Microwave Imager (TMI). The rain rates are then overlaid on infrared (IR) data from the TRMM Visible Infrared Scanner (VIRS) to create the entire image. When TRMM flew over Parma on September 30 at 1551 UTC (11:51 p.m. local Asia/Manila Time) it captured areas of heavy rainfall around the storm's eye. Most of the storm was seen dumping moderate rainfall between .78 to 1.57 inches per hour, however, in several areas around the eye heavy rain was falling at almost 2 inches per hour. NASA's Terra satellite flew over Parma on October 1 at 2:25 UTC (10:25 a.m. local Asia/Manila Time) and its Moderate Imaging Spectroradiometer (MODIS) instrument captured a visible image of Parma's clouds as the storm's center was approaching the Philippines, part of which are already under a part of Parma's clouds. Parma maintained intensity as a super typhoon over six hours (from 0300 UTC to 0900 UTC), and is forecast to further intensify prior to landfall on the northeastern coast of Luzon near 48 hours. After landfalling on the Luzon coast, computer forecast models take Parma toward China.